Photo of fireplace by Cathie Bruner. 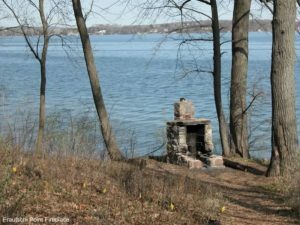 Little is known about the outdoor fireplace on Frautschi Point. We can guess that it was built for the Stevens/Jackson family, perhaps in the 1920s, as it is located just to the north of the former family cottage. If you have any stories about the early use of the fireplace (or photographs), please let us know. In the summer of 2009, the fireplace received a careful restoration by skilled masons from the university’s Physical Plant. Missing stones were replaced, graffiti removed, and the flue was repaired. The 2009 fireplace restoration was made possible by a generous gift from the the Walter A. and Dorothy Jones Frautschi Trust. The Frautschi family not only provided the funds to acquire the former Second Point property for the university, but they also have endowed a maintenance fund for its long-term care. 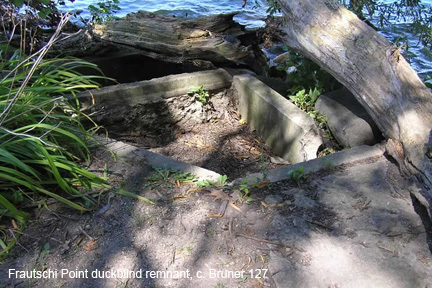 Nearby at the water’s edge, you can see the remains of an old duck blind. We are told that the concrete foundation for the blind (still visible), had two compartments: one for the hunters and the second for the woodburning stove that was used to keep them warm!